Are you guilty of always being behind the camera and not in the photo with your family? Want to surprise Dad with a special photo of his favorite people? Need an idea for a great Mother’s Day gift? A special “Mommy & Me” mini photo session with Eleanor Grace Photography would be an ideal present for Mother’s Day! What is a mini session? Mini sessions are short and sweet photo shoots (20-30 minutes) that take place at a pre-selected outdoor location (in this case, the Public Garden). It is a wonderful way to capture of a few great moments with your child and family as an alternative to a more personalized full session. 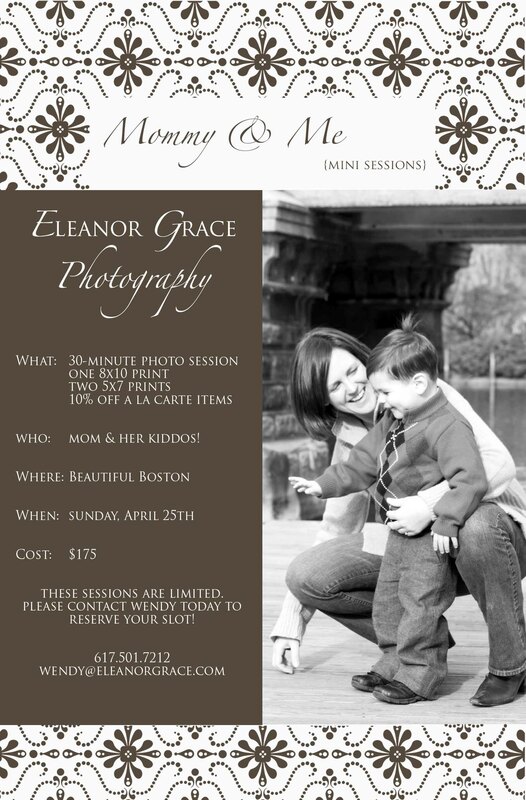 Eleanor Grace Photography is hosting a special “Mommy & Me” mini session on Sunday, April 25th, 2010 at the Boston Public Garden. A rain date will be coordinated with clients, if necessary. What do you get? A 20-30 minute on-location photo session, one 8×10 print, two 5×7 prints, and an 10% off additional a la carte items. You will receive a link to a private online gallery where you can view your finished images (typically 10-15 images for a mini session) so you can select your prints. Can’t get into Boston or April 25th doesn’t work for you? Well, get a group of four or more families together for mini-sessions and Eleanor Grace will come to a location of your choosing (within 20 miles of Boston) on a date that works for all of us! The fine print. The Mommy & Me mini session package is priced at $175. Since this is for Mom, she needs to be in all of the pictures! This is also a great opportunity for maternity photos as well. All sessions are by appointment only. Payment is due prior to shooting. No additional session fee. No minimum order. Additional prints, canvases, albums and high-resolution digital negatives are available for purchase as add-ons. This offer is only good until May 8th, 2010. Want to book a session? Have other questions? Contact Wendy at wendy@eleanorgrace.com or 617-501-7212 to book your session or if you have any questions!